NEM-Watch is installed with an empty database. If you were to keep NEM-Watch running continuously, it will store up to 30 days’ worth of data, removing the old data periodically in order to manage the database size. The Australian Energy Market Operator (AEMO) operates the NEM. They publish huge volumes of data (some in real time, some delayed for confidentiality reasons) into the public domain. NEM-Watch updates a core set of this relevant information to help you filter through the noise to see a clear picture of what’s most important in a market overview. Here’s an explanation of what NEM-Watch conveys. Beginning with version 10 in 2015, we have introduced a near real-time feed of estimated live aggregate solar output for each region of the NEM. This estimate is compiled by the Australian PV Institute (APVI) following from development work completed based on funding from ARENA. This page explains the data provided by the APVI. 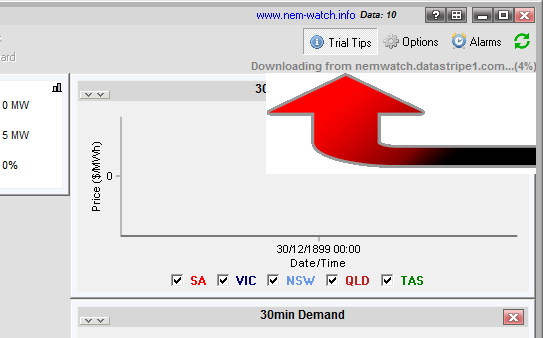 Beginning in 2001 with the release of NEM-Watch v3, we incorporated into NEM-Watch a feed of weather data for large-size cities around the states that made up the NEM. This data set is further explained here. In response to the NEM-wide drought of 2007, we introduced a display of relevant water storages at water in the upgrade to NEM-Watch v8. As explained here, this required the weekly sampling of a significant number of 3rd party sources to be able to publish a NEM-wide view of relevant (hydro and thermal) water storage capacity. We continue to be on the lookout for other relevant data sets that will further enhance the value of NEM-Watch as a clear overview of the NEM. If you have particular data sets in mind, please let us know?